In such a maritime village, even agriculture made use of the sea. In this case, it used it for grinding grain. With increased cultivation of corn, the small river mills could not cope with the demand, so in the early 19th century the Muíño de Bazarra, (Bazarra’s Mill) was built, named after its builder. Today it is better known as Muíño de Pozo do Cachón (Waterfall Pool Mill). 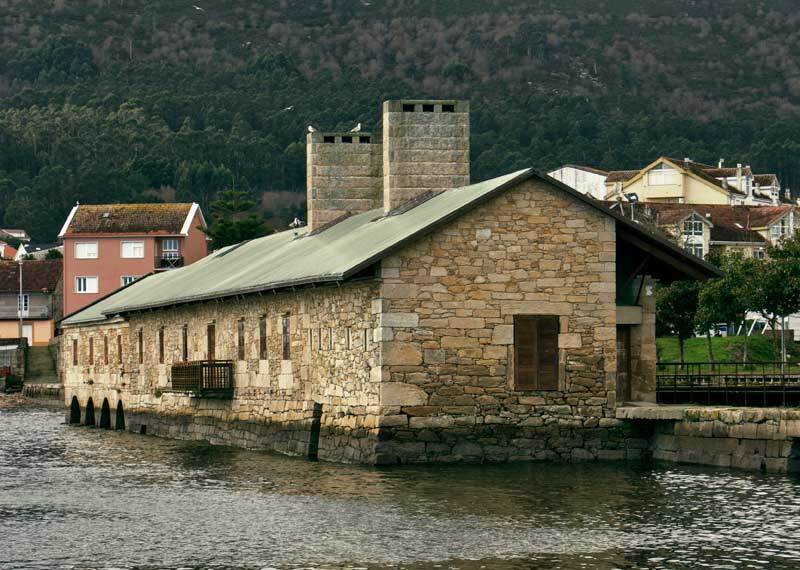 Owing to its size and state of preservation, it is one of the most important tidal mills in the Iberian Peninsula. The mill is driven by tidal rise and fall. Key to its operation is the dam, over 230m long. It fills with water at high tide and the dam is closed to prevent it flowing out. When the tide has gone out the sluices are opened, channelling the water to drive the millstones and grind the grain. Here, above these ‘moas’ (molars or millstones) stands a long building which was used for storage, and even as a bathhouse, for treatment with seawater and seaweeds. Today it is a cultural center, open to the public.